The course of peaceful running water welcomes you to this beautiful home. The clean refreshing tone of the Waterfall Retreat will become a favorable destination for your Hawaiian getaway. Enlighten your warming spirit through original artwork which complements the spacious living. Within a walking distance from downtown, the Waterfall Retreat is the key accommodation for all, looking for a convent peaceful flow within your okina experience. The breathtaking Waterfall Retreat at Reed’s Island is a spectacular 4 bedroom, 3 bath home in the exclusive area of Reed’s Island in Hilo. 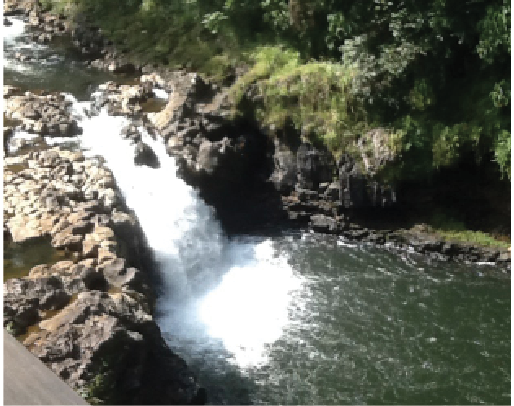 The home is only a few minutes from downtown Hilo but it feels like a private paradise retreat with a stunning river and falls right outside your window. The tropical rainforest views, Wailuku river and falls and natural beauty make this home a one-of-a-kind vacation destination. This home has many luxury features: An enclosed executive office with stunning views and 2 work areas to accommodate those who want to work and relax. The living room has large windows and sliding doors that showcase the extraordinary rainforest with picturesque views of the waterfall and Wailuku river. You may enjoy your meals in front of the waterfall out on the lanai, a relaxing area on the 700 sq ft pinewood deck. While you are on the lanai, you may enjoy the view of the well-landscaped tropical garden, the colorful flowers and plants, feel the tender-green, soft Korean Grass, and listening to nature’s symphony: the tree-frog’s greeting, the waterfall flowing and the birds singing. Kitchen is stocked with dishes and cookware for any cooking enthusiast. Coffee, herbal teas, cream and sugar provided for guests. The bathrooms are furnished with clean and new linens, soap, shampoo, conditioner and hair dryer. Other amenities include whole house surround sound system, large flat screen tv, washer and dryer and parking for 3-4 cars. Relax and stay here at the magical Waterfall Retreat at Reed’s island, an experience that you will treasure for the rest of your life. From the house, you can walk to downtown Hilo where there are a variety of restaurants, the best farmer’s market in Hawaii, Hilo Public Library, post office, and churches. A few minutes drive to Liliuokalani Garden, Banyan Drive, Coconut Island, approximately 3 minutes to Rainbow Falls, 14 minutes to Hilo Airport, 16 minutes to the well-known Nani Mau Botanical Garden, 20 minutes to Akaka Falls, and 30 minutes to Hawaii’s Volcano National Park This listing includes 3 bedrooms-the master bedroom and 2 falls view room one with a queen-size luxury bed the other with 2 double beds. The home will not be shared with any other guests and the home is used exclusively as a vacation rental. The WATERFALLS RETREAT at Reed's Island is cared for by Kristie and George and we live a few minutes up the street from the home. As our guests, we would be happy to help you find the best places to visit and we look forward to helping make your stay as comfortable as possible. Please feel free to inquire if you have any questions. Thank you! The neighborhood is minutes from downtown Hilo but because of its private and exclusive location, you feel like you are in a distant and tropical retreat. There is parking for 3-4 cars. Please note we do not serve breakfast but we do provide coffee and tea and basic condiments.